Mortuary Swords for sale are 41 inches in all and weigh 3 ½ pounds. These Half Basket Hilt Mortuary Swords are inspired by the real sword owned by Oliver Cromwell and similar to popular cavalry sabers and historical military swords. This contemporary version features a functional 33 ¼ inch high carbon steel blade that is 1 ½ inches wide. They are similar to an English Basket Hilt but feature only half a basket design. The basket is manufactured of darkened steel. The wooden handle features a real rayskin grip that features a traditional wire wrap. 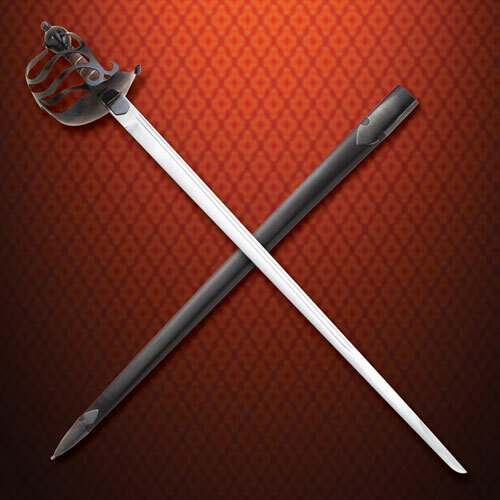 These swords include a real leather covered scabbard that is accented by dark metal fittings. Buy the handsome Mortuary Half Basket Hilt Swords for $259.99.